Frederick County is home to 5 designated Maryland Main Streets and 12 unique municipalities. The municipalities of Burkittsville and Rosemont offer beautiful scenery, small town charm and interesting architecture throughout primarily residential communities. You'll also find several unincorporated villages with shops, eateries and much more waiting for you to discover in Frederick County. Downtown Frederick’s charming streets are rich with trend-setting shops, fascinating history, independent eateries, an epicenter of art galleries and theaters, and music hot spots that groove to the beat. It’s not hard to see why Frederick ranks among the top 10 Downtowns in America. Frederick truly has something for everyone. Stroll along Carroll Creek Park where fountains, bridges, and water lilies are a pedestrian’s dream come true. Tour and taste craft beverages at a local distillery or brewery, each with its own distinctive personality. Follow in the footsteps of soldiers and surgeons at the National Museum of Civil War Medicine, a landmark attraction that tells the stories of personal sacrifices and brilliant innovations of Civil War medicine. Innovations that continue to save lives today. 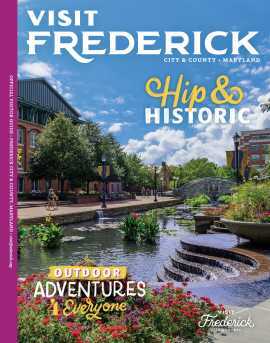 Frederick’s lively calendar of events offers something for every season of the year, including the one of a kind National Clustered Spires High Wheel Race every August that goes right through Downtown, or the Frederick Festival of the Arts. No matter the time of year, you’ll be sure to find adventure in Downtown Frederick. Just off the C&O Canal lies Brunswick. Once known as Berlin, this small community has a reputation for its railroad history and an abundance of epic outdoor recreation. With all the charms of a big city—shopping, dining, and walkability—Brunswick continues to embrace its small-town appeal and historical significance. Exhilarating outdoor and water recreational activities make this the perfect stop for all adventurers. And don’t miss The Brunswick Heritage Railroad Museum, with a 1,700 square foot HO scale model railroad depicting the B&O from Brunswick to D.C. and recreations of late Victorian rooms. After a long day of exploring, quench your thirst at Smoketown Brewing Station, a former fire station turned brewery and tasting room, or at Beans in the Belfry, a cozy hometown coffee shop housed inside a historic church building. Nestled between the Catoctin and South Mountain ranges, this picturesque town is ideal for history buffs and shopaholics alike. The landmark Zion Lutheran Church steeple is what you’ll notice first on your approach to town, but step inside for a real show of spectacular Victorian architecture. Middletown has mastered the art of embracing its past while keeping a steady eye on its future. The town’s annual Heritage Festival brings festive entertainment, food, and history to downtown each September, while its stunning views are available year round. Come hungry because housed in the iconic Main’s Ice Cream and Butcher Shop building is The Main Cup, a delightfully eclectic eatery. Enjoy fresh Maryland seafood or a plate of jazzy fries, either is sure to please. Savor award-winning wineries that dot the surrounding countryside just a stone’s throw from charming downtown Mount Airy. Homegrown shops and delicious farm-fresh fare are just a few things the locals love here. Events in every season mean ample opportunities to enjoy Mount Airy, from the Main Street Heat Chili Cook-Off, to the annual Christmas celebration, to the town’s annual Farmer’s Market, where local produce, live music, and inspired demonstrations delight each summer. At the foothill of Catoctin Mountain lies a town rich in history and natural resources, where local flavors take shape in a variety of family-owned restaurants, and unique specialty shops offer vintage finds and stylish home decor. Thousands of visitors flock here for leaf peeping every autumn and the annual Catoctin Colorfest, a festival celebrating Maryland’s colorful fall foliage and local crafts. Spruce up your own living room with a visit to Timeless Trends Boutique, a 4,000 square foot vintage warehouse, or indulge in a home-style dinner at the Mountain Gate Family Restaurant. The surrounding countryside offers a backdrop to explore twenty-five miles of hiking trails at Catoctin Mountain Park, or take in the sites at the state’s largest cascading waterfall, Cunningham Falls. Emmitsburg may be known for its deep Catholic roots, but the small town just south of the Pennsylvania border offers a perfect getaway for history lovers and adventurers alike. Kick off your visit at the Mason Dixon Welcome Center, where interpretive exhibits guide you through Maryland’s rich history, and friendly staff members direct you to exciting area attractions. A visit to both the National Shrine of Saint Elizabeth Ann Seton and the National Shrine Grotto of Our Lady of Lourdes is a necessity for gorgeous architecture, stunning views, and Civil War history. Wrap up your trip with a visit to the family-owned Carriage House Inn for any number of delicious Maryland seafood dishes! Adventure Park USA, lively amusement park, and outstanding antiques define New Market as an eastern county town with independent spirit. Visitors and locals alike could spend countless hours exploring the treasures in New Market’s assorted antique stores, but it’s the local events that give it a small-town experience not to be missed. Take in the historic architecture of New Market’s downtown buildings, and cruise on the Historic National Road, running right through downtown. Visit The Original Playhouse Children’s Museum to explore wooden castles and enchanted gardens, and finish your trip with elegant comfort food at Vintage Restaurant.